The Rebel Sweetheart. : Spotlight | Etude House Minnie Kissing Lips in Minnie Red. Spotlight | Etude House Minnie Kissing Lips in Minnie Red. When news broke out last year that Etude House and Disney will be teaming up for a limited edition makeup line, I was ecstatic. And when I first caught a glimpse of the entire collection, I made a resolve to get a hold of at least one or two of those xoxo Minnie products. And that I did. I got me one of those lipsticks, thanks to Charmaine of Kkochi Pida. There are actually two shades in the Minnie Kissing Lips line - #1 Minnie Red and #2 Bubble Pink. I have the #1 shade, and I hope I can add the #2 shade in my collection soon. Minnie Kissing Lips #1 - Minnie Red. A moisturizing cream lipstick, Minnie Red has a lightweight feel that keeps the lips soft and hydrated. It has a solid red color with a hint of luminous shine. The color is buildable, and has an opaque finish. Staying power is a good five hours, with a bit of drinking or eating. I don't mind retouching my lips though, as I love the mild scent of this lipstick, and how it glides on my lips like a dream. And the uber cute packaging plus the bold red color get a lot of attention in the powder room. Haha! Here's how the lipstick looks like when worn. Minnie Red on my lips. - The super cute packaging. - Stays on for at least five hours. - Available only in Korea. And here's the obligatory selfie to complete this post. 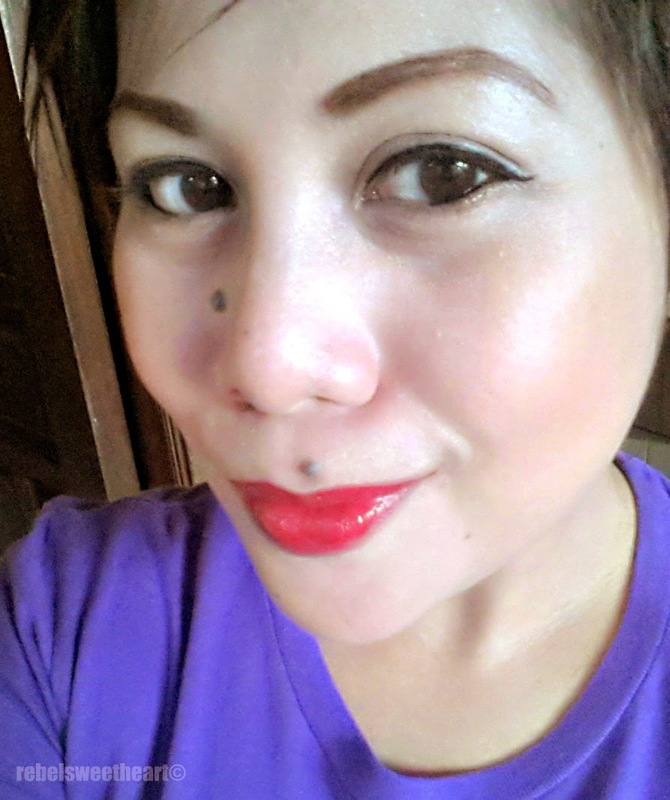 LIPS: Etude House Minnie Kissing Lips in Minnie Red. Have a wonderful week everyone, and do check out my ongoing giveaway! What?! Only available in Korea?! Waaah... I am so ready to check out the store tomorrow! the shade and packaging is love!! :) I hope they have lighter shades! What you might not like: Available only in Korea... I was like... "I'm so gonna buy this just because it's Minnie Mouse" but then I saw the last statement and it's just such a bummer! Hahaha! Well that is just adorable with the Minnie Mouse on it! Only in Korea. Bah. My daughter was all over this until we saw that! i love the packaging its so cute ,and the color too it suit you dear .. how i wish red color lip-pies suit me too..
That looks like a great color. i love the Minnie Mouse packaging. so sweet--not brave enough to do the bold red lip myself =] BUMMER not available in the US. My daughter is going to freak out! such adorable packaging! I always have a soft spot for Mickey and Minnie and I am soo envious! adore the shade too...looks good on you! The packaging is so cute and the red lipstick never goes wrong on any ladies lips. Wow! That looks great on you! I definitely can't get away with red lips but more power to those who can!